his office at the kennel. Cajun and his kennel mates set a new standard for the APLA Master level tests. The difficulty of the retriever setups was raised significantly, requiring far greater training for the dogs to pass the tests. As Hershey and the son of Hershey continued to garner attention and championships in the upland and waterfowl world, the belief and interest in the pointing Labs grew by leaps and bounds. 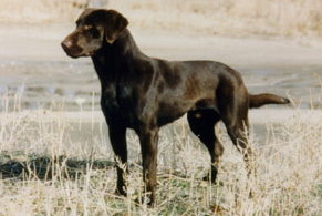 Amongst a few other dogs, these dogs changed the face of pointing dogs and retrievers in the hunting community and as mentioned with Hershey, Cajun is found in the vast majority of chocolate and chocolate factored dogs in the pointing lab community today. Just as it was with his father Hershey, Cajun raised puppies, kittens, and baby humans as he went through his training and competitive years, always a gentle giant among hunting dogs. Cajun has also produced multiple GMPR’s, AKC MH’s, HRCh’s and qualified all-age field trial dogs.